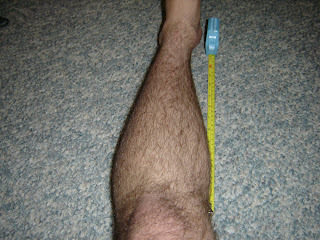 The tape measure doesn't end at the same spot along the knee but it begins at the same spot at the ankle. The latest picture starts at 16 1/4". 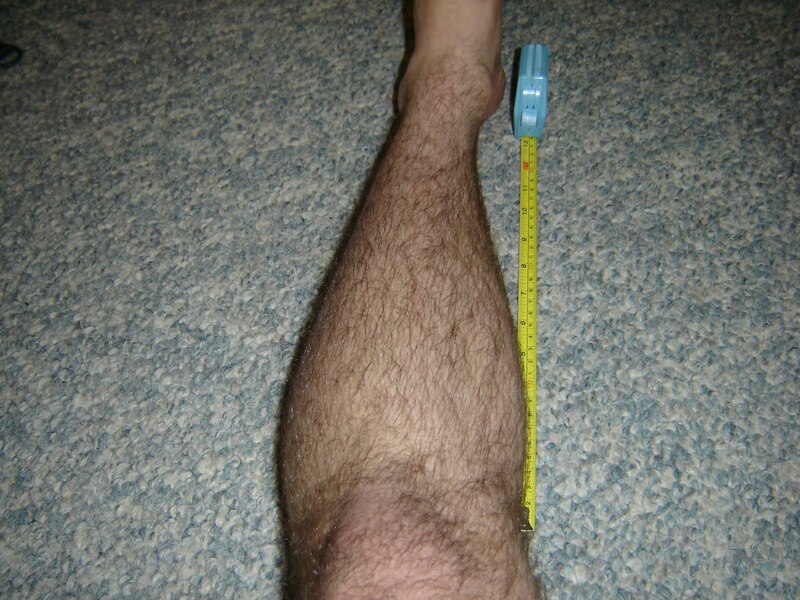 I slide a ruler down to the very beginning of the knee(around where the calf ends) and I get 4 inches. That's 12 1/4" from ankle to knee. Doing this with the first picture the ruler slides down to about 3 cm(you can't see the inches). 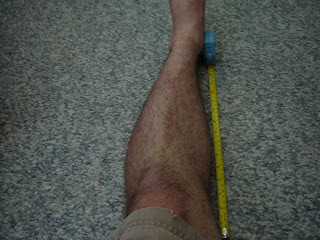 Which is a little less than an inch and a fifth.The ankle starts at 13 1/4". Which would lead to about 12 1/4". 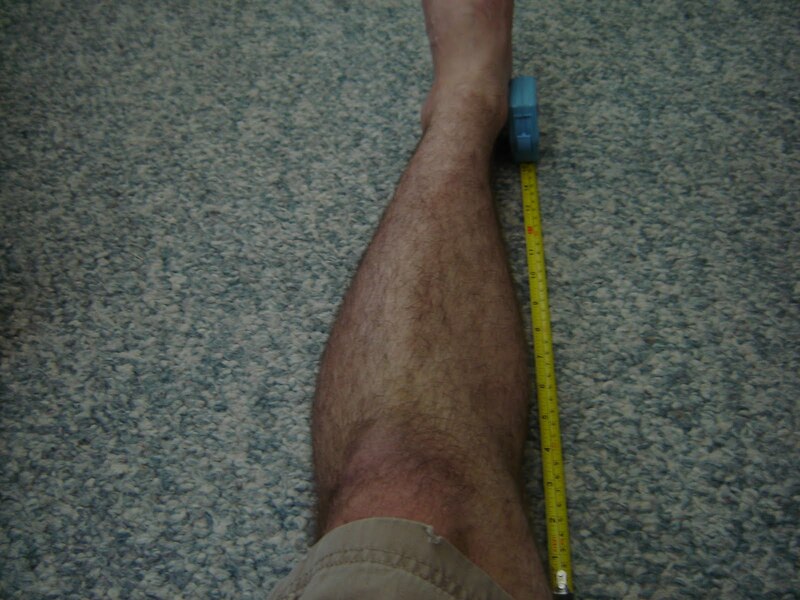 In this picture, the ruler starts at the same location at the knee and ends(approximately) at the same location of the ankle but the ruler only goes up to 15 1/4" meaning a 1 inch length increase between then and now. This is at 15 3/4". I know the photo is blurry but you can count which would mean a 1/2" increase between then and now. If you look at the first picture and the pictures now you can see that the majority of the height was in the epiphysis(which is where the stem cells would differentiate into chondrocytes). For some reason, growth isn't occurring by the ankle even though you can generate much more relative pressure. I'm still working on that finger proof and others at the LSJL forum are working as well but I hope you take the time to analyze the photos and see the length gain in the knee epiphysis. Yes, the finger video will be definitive proof as long as the finger length difference is substantial or at least undeniably noticeable and the video is a moving picture and not a video of a still image. However, it does seem strange that you never discuss how people you see on a regular basis react to your 1.5 inch height increase in your late twenties. Don't neglect the human factor when trying to spread the word. It's not scientific proof but at it captures the imagination and motivates hearing stories about how people react(1.5" is a major height increase)...do they look at your shoes to see if you're wearing lifts? Do people want to know how you grew? Did you have to buy all new pants? was your coordination affected? Is one leg slightly longer? Do your left and right knees or ankles still match each other's look width-wise now, do your knees now look too much wider which is not good aesthetically? Are you exactly as you were before except 1.5" taller or is there a negative side like pain or legs look different/asymmetrical? Etc.... All this along with the finger video would give people a much fuller picture and should help "convert" people to believing in LSJL. PS: you're only doing the loading - not more - right? People don't look at my shoes. At Thanksgiving I was measured against my family and they pegged me at a little under 5'10" rather than the 5'8 1/2" they've always measured me at but they didn't remember my old height or just assumed that the old measurement was measurement error. At the gym for instance, I don't tend to stand directly next to people so they wouldn't notice. I didn't have to buy all new pants. My pants ride up a little bit more but in general my pants were too long for my leg length and now they fit better. My left leg is slightly longer(because that was the leg I loaded first during the experiments and the leg that I was using for results) but I'm working on evening them out. I have wider leg bones now. 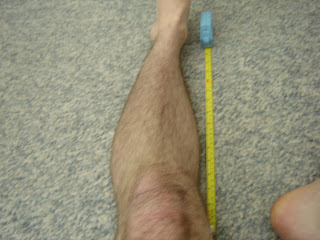 If you just look at my knee epiphysis you can see that it's longer and more well defined. I think it looks better. At the gym, I'm having to use less weight but gradually I'm getting back up to where I was. Thanks for the info, so have you taken any supplements or did you do just the loading and could you post a few pics or drawings where you describe the technique in a bit more detail? If feel a few minutes after loading there's like a rush of blood or whaterver going into my bones - is that a right feeling? I so want to believe...but your pictures are so inconclusive that I have to think that there is nothing so see here. For someone who supposedly speaks in such scientific terms, where are your scientific measurements? Sorry if this offends but you have shown zero evidence so far that this method works. I'm doing all the SEO techniques to try to get money so I can get more conclusive techniques. It costs money to make scientific measurements! And there are tons of confounding variables in height. I was hoping someone would dissect the pictures and they could photographically show that there was height gain but it's hard to get people to care. I'm working on the finger length gain, what else do you want me to do that doesn't cost money. I wouldn't make an ebook unless I had absolute proof of results and it would cost like a normal book unless I offered something like support. Ebook would just be a way to get people to be able to pay for support and without all the science. People who just want proof + the method + support. But I would need good before and after pictures before that happens. The people are not going to come without results or another LSJL study. Bodybuilding Science has shown that to be the case. I'm going to do my best to make those things happen. Well, at least you replied - I didn't think that you would. That you did does show that what you are doing could be legit. Guess I will have to shell out for some clamps after all. Good luck, I hope it works out for you. It`s seems strange to me, but this is only my opinion. I`ve just started to follow your posts, and I think that some of the methods look fake, especially this one, I`m distrustful to almost every home-made treatments, especially to this which are shown as a very efficient. Streching bones by weight probably can seriously deformate your bones and etc.